DFA 1979 offered an endearingly roguish, self-mocking take on extreme male behaviour, in all of its priapic, hedonistic glory. Why See Death From Above? Death From Above Celebrate 16 Years Of Heads Up! Times they are a-changing! Having been together for four years since ending their hiatus, Death From Above dropped the '1979' from their name and emerged a band anew, releasing their third album 'Outrage! Is Now' in 2017. 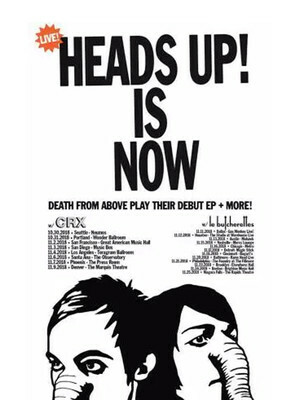 But the electronic bass-and-drums duo are heading back to their early roots for the sweet sixteen anniversary of their 2002 debut 'Heads Up! 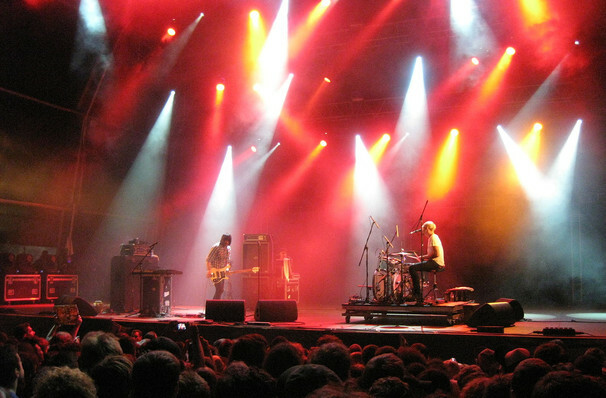 ', performing the EP's six tracks in full during a mammoth 25-date North American fall tour. Known for their no-holds-barred, high-octane shows, Death From Above furiously blend fizzing electronica with a hard rock edge and DIY punk aesthetic, and it boy does it show in their live set. They do nothing short of unleash hell, inciting mosh pits, walls of death and even crowd-surfing during their riotous renditions of classics like Romantic Rights, Blood On Our Hands and Black History Month. Wear comfortable shoes, because this is definitely not a sit-down gig! Seen Death From Above? Loved it? Hated it? Sound good to you? Share this page on social media and let your friends know about Death From Above at Studio at Warehouse Live. Please note: The term Studio at Warehouse Live and/or Death From Above as well as all associated graphics, logos, and/or other trademarks, tradenames or copyrights are the property of the Studio at Warehouse Live and/or Death From Above and are used herein for factual descriptive purposes only. We are in no way associated with or authorized by the Studio at Warehouse Live and/or Death From Above and neither that entity nor any of its affiliates have licensed or endorsed us to sell tickets, goods and or services in conjunction with their events.